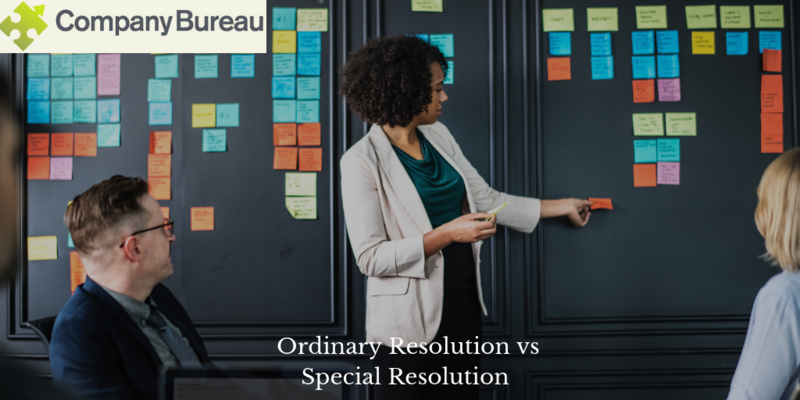 What is a ordinary resolution vs a special resolution? What is the difference between an Ordinary Resolution and a Special Resolution? A resolution is a formal name for a decision made at a meeting of a company. Shareholders (members), being holders of shares, that are entitled to vote on decisions at either the Annual General Meeting or an Extraordinary General Meeting to make choices as to what a company will do next. While minutes at the meeting will track what was said and are a general overview of a meeting, a written resolution formally lays down a particular choice or decision made by the members of the company. There are varying levels of resolution depending on the size of the decision made by a company, simply divided into a Special Resolution and an Ordinary Resolution. What is an Ordinary Resolution? An Ordinary Resolution handles the standard actions typically associated with running a business. In effect this covers the normal things a business would need to do, e.g. vote on giving people new shares, changing a director, making a small investment like office materials or a revamp. This ordinary resolution type needs a simple majority under the Companies Act 2014, that is to say above 50% of the members are required to sign. What is a Special Resolution? A Special Resolution is, as the name suggests, for special or uncommon decisions a company takes. Things like a Change of Constitution or Name, Large Capital Investment or changing the share structure of a business would require a special resolution. The rules under the Companies Act 2014 specify that the special resolution requires the signature of more than 75% of voting members in order to be put in place. The Companies Act 2014 allows for and lists the conditions of both types of resolutions under Sections 191 – 198. Unanimous Resolution – as the name suggests all voting members of a company are required to sign off on a unanimous resolution – it becomes effective immediately and will always be used for single-member companies (1 person or company is the 100% shareholder). Majority Resolution – in this case, once the required majority has signed the resolution there is a period of time to wait before it comes into being. For the 50%+ ordinary resolution it is 7 days and for the 75%+ special resolution, it will take 21 days to come into force. In all cases, once a special resolution has been passed a company is required to file a copy of the same with the Companies Registration Office within 15 days of the date it has been passed. What is a Director’s Resolution? A Director’s Resolution is the formal record of a decision made by the directors of a company. During any meeting of the board, directors may vote on various steps the company is to take once it is within their power to do so. Once a decision is made outside of the ordinary day-to-day running of the business, the secretary will be instructed to draft a resolution confirming the details to be signed by the directors. This resolution is held for company records. The scope of what decisions can be covered by this resolution type along with the director’s powers are set internally. For the most part, resolutions are required in written format and retained on record by the company. Under the Companies Act 2014 a company can include provisions in their Constitution to alter what a company can do. In the case of resolutions, a change of Constitution can be used to add clauses to avoid having to draft written resolutions for certain actions which can simply be approved by vote at a general or extraordinary meeting. Should you have any queries on types of Resolutions, a change of Constitution or any element of the Companies Act 2014, feel free to get in touch with Company Bureau on 01-6461625 or drop us a mail at cosec@companybureau.ie. How can my Irish Company show it has a ‘Real and Continuous Link’ for the purposes of avoiding the non-resident bond? Copyright © 2019 Company Bureau. All rights reserved.